Although I never met him, I thought I understood who he was. At the levayah on Thursday, I learned how wrong I was. I thought I understood him, because his work over the decades single-handedly created the environment for some of the work I do for the Simon Wiesenthal Center, at least insofar as evangelical Christians. At the levaya, the speakers shed light upon other important and admirable dimensions to his life. I never had imagined him to be a gartel-wearing, Shlomo-singing, guitar-playing type with boundless happiness and energy, well before anyone heard of neo-Chassidus. I had thought that the claims about how much money he had raised for Israel and other causes – about $1.5 billion – were the boast of a marketer. The large number of organizations that testified to the extent of his support over the decades erased that mistake. The scope and scale of whom he helped was enormous. I had thought that whatever he distributed was a function of how successful he had been in tapping into conservative Christian support for Israel. I learned that I had reversed things. What he distributed was primarily a function of his love for Jews, Israel, and humanity (including a campaign for poor Muslims in Morocco during Ramadan), especially including individuals, not just large entities. Finding the donors was secondary. I learned that he was one of the very rare individuals who was successful in a demanding vocation, but still managed to tune out all else when devoting himself to his children. I was surprised at how many who spoke did not fully grasp how important a non-monetary contribution he made to the Jewish State, firming up the support of tens of millions of ardent supporters of Israel in the evangelical community. The only one who got that right was Nir Barkat, the former mayor of Jerusalem. That support is invaluable; no amount of money could have bought it. That support, bederech hateva, will remain an important component of Israel’s arsenal in fighting the war to delegitimize it. For our readers, an important nuance of the above has to be added, that I believe even the former mayor missed. Christians who have learned for a variety of reasons to support Jews and Israel sometimes are hard-pressed to figure out why G-d wants them to bless people whose values are often so contradictory to their own. The secular and heterodox Jews they run into are passionate about abortion rights and gay marriage, and don’t seem very keyed into Scripture. Evangelicals can live with the contradiction, because they trust G-d. But cognitive dissonance still exacts a price. We learned that many centuries ago. That’s why giants like R Aharon HaLevi wrote Sefer HaChinuch. They realized that committed Jews will faithfully observe all of HKBH’s commandments, even if they could not understand them, but that offering explanations for those mitzvos would make them much easier for people to observe! R. Yechiel Eckstein, z”l, made it much easier for conservative Christians to identify with a Jewish state without grimacing at times. Rabbi Eckstein introduced millions of Christians to nuance within the Jewish community. From him they learned that Orthodox Jews – the Jews who believed, like they did, that Torah was given by G-d – were different from others in many ways. They saw in his behavior and his values the fruits of obeying G-d’s Word. That made it easier for them to see that G-d’s continued covenant with all his people made sense. Decades after Rabbi Eckstein began the bridge building, it had become common for evangelicals to openly write about their appreciation of Orthodox Jews, as distinct from others. They knew they would never convert us, but they delighted in that those who cherished G-d’s commandments lived better lives because of it, even if they as Christians had been “freed” from the Law. Others continued the work. Most notably, ybd”l Rabbi Daniel Lapin diligently went from community to community, showing conservative Christians than not all Jews were politically liberal, and that Jews who valued Scripture were more likely than others to share some of the same political leanings that they did. One of those who eulogized R. Eckstein charged the audience with continuing his work. Some undoubtedly will see that the International Fellowship of Christians and Jews continues to flourish. All of us, though, can play a role in the kiddush Hashem that we can make in front of the many Christians who do not hate us, and in fact look to us to demonstrate that how wonderful and spiritually charged a Torah lifestyle can be. 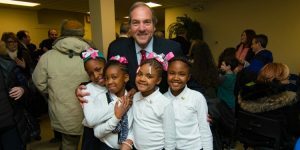 I have been a long-time admirer of Rabbi Eckstein, yet had no idea that he had a weak heart that ultimately took his life at the relatively young age of only 67. Wow. He looked so healthy and vibrant to me, so his death has been pretty shocking to me. I have to wonder why G-d would take away such an important, much-needed man from our Jewish people, but then again, I am not G-d, and His Ways are not My Ways. I think what amazed me the most about Rabbi Eckstein, was his very strong belief and commitment to the Torah way of life. I say that because it is my distinct impression that he was often a lone wolf, immersing himself fully among Christians, something almost no Orthodox Jew would even consider doing, and yet never, ever compromising his Judaism in the least. Yes, I know that on a purely intellectual level, that the tenants of Christianity are pretty easy for us traditional Jews to negate, but we also have our emotions to contend with, and sometimes those emotions can cause us to be very heavily influenced by whatever environment we are in. I know for myself, that as nonsensical as I find specifically Christian beliefs to be, that every year around late December, I find myself quietly singing Christmas music in my head, as I admire all the Christmas decorations, finding it all to be so very beautiful and even appealing. And yet despite his largely Christian environment, Rabbi Eckstein somehow managed to remain as fully Torah observant as even the most religious of Jews. He also apparently effectively transmitted all that to his extraordinarily sweet daughters, whom I hope will continue his very special legacy. May they be comforted among the Mourners of Zion and Jerusalem. Beautiful hesped, Rabbi Adlerstein, and thank you for the mention. May I suggest that Rabbi Daniel Lapin become a regular contributor to articles posted on this website? It would make perfect sense, since he is solidly Orthodox and yet does not run away from controversy. I appreciate your kind and encouraging words. While it is true that I do not flee controversy and it is true that I disparage as cowards, those who describe their enemies as ‘controversial’ instead of debating the merits, I do not particularly enjoy being embroiled in controversy. I certainly do not court it. As Mary often said about her little lamb, “It just seems to follow me everywhere!” I fear that even if this distinguished journal were to accept my occasional modest submission, it would do me more harm than good. I am often breathless with astonishment at Rabbi Adlerstein’s ability to respond to abuse with calm and rational surgically delivered devastating missile strikes and always sounding as if he has a gentle smile on his face. (Which he probably does). With me it’s more howitzers and scowls. On my website ( http://www.RabbiDanielLapin.com) I publish a weekly column called “Thought Tools” in which I attempt to link a dvar Torah to some practical life lesson. Because my subscriber base is 90% gentile, (which means my Jewish readership is still four times our demographic representation!) I almost never hear from people who dispute my understanding of a straightforward medrash or other ma’amar chazal. Seldom does anyone ignore the main point to challenge my inference from Loshon HaKodesh. It’s kinda’ different writing for an Orthodox Jewish audience. Much, much harder. Much much more likely to stimulate controversy. I have a theory which states that ever since the mission delivered to us at Ma’amad Har Sinai, every Jew either wants to be a rabbi or believes he already is. It’s not that easy to write regularly for an audience of thousands of ‘rabbis’. But Rabbi Adlerstein does it and does it successfully delivering real value. Now if I were to write something for these pages (which won’t be happening) but just hypothetically, I would find myself irresistibly drawn towards addressing the discussion about whether or not the “gedoylim” have ruled on the reputation of Rabbi Eckstein ah”sh and indeed on the value of such rulings in the first place. I’d probably feel compelled to ask whether the entire protocol of asking the ‘gedoylim’ about ‘da’as Torah’ hasn’t just about run its course. I would rather obnoxiously contrast this tendency to inquire of the Oracles about each and every detail of life with my own practice which has always been to raise independent talmidim who will always ask and follow halachic rulings but will with equal determination take responsibility for their own lives, decisions, and judgments. And you know what a firestorm of protest and controversy that would unleash. So it is surely far far better that I continue to watch and enjoy from the sidelines as I contemplate the work of better writers with more sharply focused lenses than mine. So there is good news and bad. The good: Thanks go to you for the brutally honest, trenchant analysis. The bad: If you have any grandchildren in charedi schools in Israel, they have just been thrown out. I have to say that in reading what Rabbi Lapin wrote above, it leaves me with a feeling of sadness, as I recall how approximately 25 years ago, I started attending his Torah lectures at the Pacific Jewish Center over in the People’s Republic of Santa Monica. I say sad, because I had the privilege of attending relatively few of his lectures, since I discovered him relatively late. It wasn’t long before he left that shul altogether, moving to Mercer Island over in Washington State. But let me tell those of you reading this who may not have had the privilege of knowing this from direct experience, namely that a hallmark of Rabbi Lapin’s lectures, was that there was never, ever a dull moment in them. I would find myself on the edge of my seat, anxiously waiting what it is he would say next. The man is not only brilliant, not only thoroughly immersed in Torah knowledge, but his mind is just so quick, so original, so creative, and so thought provoking. I am sure I speak for countless numbers of people when I say that when he left Southern California, a palpable spiritual darkness descended on this city. I had not thought of it when I wrote what I originally wrote about Rabbi Eckstein above, but in a way, all three Rabbis under discussion here (Rabbi Adlerstein, Rabbi Eckstein, and Rabbi Lapin) all share that trait of going against the tide, of thinking for themselves, of not resorting to cliches, even while all three are about as strongly Orthodox in their orientation as one is ever likely to meet. There are a couple of other Rabbis whom I would also put in that category, namely Rabbi Natan Slifkin and Rabbi Nathan Cardozo, although if those latter two Rabbis are too controversial for it to be a good thing to be compared to them, then I apologize. All I know is that as far as I am concerned, all forms of expressions of Judaism are legitimate, just as long as they are Orthodox. and if somebody thinks independently like all of those men I mentioned do, then all the better, at least in my perception. I just do not have much respect for those who just follow the heard, repeating phrases they heard from others, without thinking things through or possibly challenging ideas discussed within the Torah world. One more thing before I go. I did not mean to say that Rabbi Lapin invites controversy. It is not that at all, but rather the other way around. See, because of his very active and original mind, there are those who somehow feel threatened by that, and it is they who cause the controversies. And Rabbi Lapin is never afraid to respond to them, because he is a man dedicated to the truth of things. Very simple. Other gedolim have opined very, very differently! Yes, I have heard it straight from their mouths. There is much to be said on the topic. R. Elyoshiv, R. Ovadyah Yosef, R. Shmuel Auerbach, R. M. Eliyahu and many others all opppsed the IFCJ. There are two kinds of people who would take issue with an All-Star lineup like that. Kalim. And people with pleitzos. Those I spoke to are in the latter category. I feel sorry for those who don’t realize that they exist. Kind of hard for readers who know me not to be thinking that I have far better Torah sanction to praise R. Eckstein than you do to have a computer and be hanging around blogs! a famous doctor, who you know but will remain unidentified, spent many years asking sheailot to both RSZA ztl and RSYE ztl. the difference he described is the best answer and one that applies broadly to how different rabbis respond to sheailot. and the gratuitous remark about rabbi riskin requires that the individual go and beg forgiveness, perhaps from both of you. I personally do not have any skin in the game on this particular person or topic. But, your reaction speaks to the fact that many will read online about such psakim, reportedly from great Rabbis (in Israel) who were previously disconnected with the issue–and almost always disconnected with the communities outside of their personal milieus. As these things go, the questions are often nuanced and the presenters of the questions will frequently have an agenda of the way they want the response to be positioned and publicized. Even without this well-placed cynicism about Askanim, with no scholarly published teshuvot (which would be totally within their bandwidth, especially if the issue was significant enough to them), it is never clear what question the Rabbis actually heard and are opining on. And merely being a signee on some Kol Koreh does not meet the threshold of a scholarly teshuva. Then, the “second-level Askanim” in different communities read these posts and take that as a personal imperative to broadly push them out as “Daas Torah”, applying them locally as they see fit. It wasn’t until this weekend that I discovered he was involved in early Jewish muisc groups such as The Rabbis’ Sons and Kol Solonika. Rabbi Eckstein wrote an inscription on his biography copy he sent to Rabbi Bechhofer, whose Daf Yomi shiur he attended, in which he expresses “appreciation for ‘taking me in’ when others would not” and “appreciation for teaching me Torah”. R. Bechhofer wrote in turn to R. Eckstein’s daughter on FB, “it was a joy and an intellectual challenge to have your father z”l in our daf yomi shiur. He was an incredibly brilliant, warm and idealistic person. Please convey my deepest regrets and most profound tanchumin to your family”(Emes Vemunah blog comments). Are there any generally recognized halachic red lines in our approach to non-Jews for moral support? Also, you said in your comment above that gedolim have had opposing positions in this instance. Could you summarize the main positions you’ve encountered, pro and con? Thanks! When you responded this, yet you do not seem comfortable sharing with us who they are? Do you think it is an embarrassment to acknowledge it? Why wouldn’t you share that info. Your position would then be so much stronger. Because, in the community we live in, anyone with anything novel or valuable to say will then be set upon by tinok-shelo-kalu-lo-chadashav types like the guy I responded to! Why would I want to cause them the loss of time and the effort? (Besides, in some cases they explicitly directed that their names not be used. That is par for the course today. I remember R Eckstein well from YU. Always with a warm smile in his face. Y’hi zichro Baruch. Thank you for an amazing synopsis of a warrior for Jewish values & dedication to the Jewish nation. it goes without saying that the type of Gdolim that RYA relies upon may have big pleytzas, but not so big as to disagree with the Pantheon rabbis in the light of day…. Lacosta’s comment of February 12, 2019 at 10:28 am raises an interesting point. What makes some poskim, or their people, eager to publicize their decisions on public issues, while other poskim will only discuss their decisions in private? Are the latter just being more modest, or do they fear that someone might pose a threat, even physical? We could have a big problem. That was precisely what Rav Shlomo Goren said when he refused to divulge the names of the rabbonim who issued the psak that the Langer children were not mamzerim. We all know how the majority of the Torah community reacted to that. Very true. But, alas, it is also true that the goons were out in full force threatening Rav Moshe’s life when he wrote his teshuva about artificial insemination. And they have hardly disappeared. Ask people who backed unapproved – albeit fully charedi – candidates in the recent, last elections in Israel. in haredi Israel, the problem would as RYA attests be physical danger. in the western world, this is akin to expressing a non-PC view on issues such as climate, gender etc. in the secular world, one loses ones career more than risk of life and limb. in the closed hareili society it’s shunning plus physical danger…. I listened to the interview. Please play the opening over, and listen carefully. It is clear that what R Eckstein had been doing before the show – and continued to do during the interview – was to argue AGAINST proselytizing to Jews! It is clear as day that he had been telling them all the reasons why Jews are offended by it; why it is so often deceptive, duplicitous, and overly aggressive; and why Jews were bad candidates for their efforts. That is what the host meant. He had gotten multiple earfuls from R. Eckstein about why NOT to proselytize, so he was going to have to tweak his pitch. Given those facts, R. Eckstein tried with tact and reasonableness to limit their effort. He gave it quite a good shot. (This was 30 years ago. I can only imagine that he got better with time, not worse.) We know that it was a good shot, because we know that in some cases, it worked. Rabbi Aryeh Scheinberg (brother of R. Chaim Pinchas Scheinberg, zt”l, and someone whose charedi credentials are beyond cavil) has maintained a decades-long relationship with Pastor John Hagee of CUFI. In the course of time, his arguments against proselytizing to Jews made such an impression on Hagee that he started preaching against it. (He took heat for it, but he basically stood his ground.) Proselytizing is always a triage situation. You can’t reach everyone, so you have to prioritize. The best shot at LIMITING proselytizing (there is no way to end it) is to convince Christians that for a slew of reasons (most of which R. Eckstein mentioned in the interview, albeit briefly), Jews should be at the bottom of the list. I believe that over the decades, R Eckstein reduced the vulnerability of Jews, not increased it. In any event, there was nothing in that interview that indicated that he was soft on proselytizing. The people of the website you point to who have fought off the influence of proselytizing come from a good place. It should pain all Jews that, until Moshiach comes, it is virtually a certainty that other religions will be free to both practice in Israel, and to speak their minds. Anathematizing R. Eckstein is not the solution. It is actually counter-productive. We have to politely let people know that just as they are legally allowed to by the law of the land to preach, we are allowed to just as vocally resist. And we should. Exactly as R. Eckstein said, “We can’t ask you not to be Christians; by the same token you can’t expect us not to be Jews.” Our resistance can and must come without violence, and without harassment. That can be done. And it can be done without sacrificing the support of hundreds of millions of people. If we had to make that sacrifice, of course we would do so, and leave the rest in the hands of the Ribbono Shel Olam. But as far as I can tell, keeping the relationship friendly increases – not decreases – the chances of getting many of the proselytizers to lower the volume. The others didn’t need R Eckstein’s organization to find a reason to make Israel their vocational destination. There is absolutely no question that we want to keep all our Yidden at maximum distance from any and all proselytizers. As someone who has been following and admiring Rabbi Adlerstein , mostly from afar, I feel obligated to chime in. Whenever someone really does something letovas hatzibbur, and Lshem Shamayim, he will almost always have to deal with self described and self identifying Shomrei Mishmeres, who are always there to criticize. Gedolei Yisrael have the right to express opinions, and to be taken seriously. In my experience that is what they want. They are also very well attuned to the fact that there are those who act differently, and they do not feel the need to react. On the other hand there are those who feel the need to criticize others, for a variety of reasons. In some cases it is because they cannot really explain why they do nothing, so they hide behind the gedolim. In some cases their Jewish education has led them in the wrong direction, and in some cases they just like feeling superior. Rabbi Adlerstein, your heart and the rest of you are in the right place there is really no need to be nispael from everyone who sends in a note. Thanks, Reb Mechoel. It’s not everyday that I receive some chizuk from a descendant of the Divrei Chaim! Rabbi Adlerstein, as someone who is uninformed about the subtleties of the issue of engaging with Christians, what would you recommend that I read to become more educated? I would like to learn both about the halachik and hashkafic issues, and also what the positions of the different Christian groups are with regard to the return of Jews to the Land of Israel. Is there any resource or list of resources you could recommend? Thanks for this eye opening piece and for the hard work you do for Klal Yisrael, especially in this complicated field. Get me a grant, and I will be happy to write it! Based on comments in this discussion, we also need another resource guide, “How to mobilize intramural self-defense for beleaguered poskim.” Maybe anti-terrorist funding is available somewhere. I wish this would be funny. Since it’s not funny, is there a feasible action plan? I rather doubt that we’re dealing with disconnected lone wolves. There is no action plan that anyone I know has been able to come up with. Truth be told, we may not really want one. Human societies are imperfect, and will remain that way till Moshiach comes. In the interim, the element that seems to be missing most of the time is balance. Different groups understand many of the principles, but they all emphasize some at the expense of others. Hitting the sweet spot in the middle keeps on evading us. So people identify with whichever side emphasize the extreme that resonates most. Bottom line is that within the Orthodox community, we benefit from – or are plagued by, depending on what mood you are in – two extremes. One emphasizes individual freedom (within halacha, of course) and the other authority. The result is that we have to choose between communities with too little authority, or two much. I chafe at every bit of unnecessary authority telling me what I ought, or ought not to do, that goes beyond halachic norms and/or recognizably justified public policy. Yet, my own opinion FWIW is that if I had to choose between the two extremes, I will go for too much authority rather than too little. So until Moshiach arrives, I will grumble (and do what I can to evade the oftentimes silly extremes of the social pressure to conform), but I will still identify with groups that maintain authority and (sometimes healthy) community pressure. All that said, although I can’t suggest the action plan that you seek, I can offer a modus vivendi. Find people who are well-enough placed that they have access to the people who are a bit more independent, and take their counsel – even when they can’t cite their sources for fear of reprisals/nudniks, etc. This is fine if we can pick among authorities to give us direction, or if we have one locally that all follow. If that choice, or that locality, doesn’t suit us, we can attempt to find a better one. But what if A insists that B must follow the authority he favors, or else? A and B can also be groups. “Else” can take many forms. We don’t currently have an organizational chart of Klal Yisrael. There is some structure here and there, but instant electronic communications seem to have caused disorder by cutting out the middlemen. Someone who attended Torah Vodaas during this period told me how once on a Motzoie Shabbos, he remembered seeing R. Moshe Wolfson, longtime Mashgiach of Torah Vodaas, rushing out of the yeshiva with a group of twenty boys. Rav Moshe was coming to speak at a melava malka at the Young Israel of Willamsburg(R. Mickey Weinberger’s shul), and Rav Wolfson and his entourage were going to protect R. Moshe who was threatened after he wrote the teshuvah in question about artificial insemination. On a lighter note, and in the spirit of Adar, I once heard a recording of a shiur from a RIETS rosh yeshiva who told how some Mizrachi rabbonim in Europe were once teased by their colleagues when they said “we have a rav upon whom we rely”,for being like Esav, who also told Yaakov, “yeish li Rav” ! Despite this witticism, the rosh yeshiva concluded, the Mizrachi rabbonim were allowed to follow their own rabbinic source(while it would be most appropriate for me to disclose the source of this discussion about rabbinic disclosures, unfortunately, I don’t recall the particular shiur). Maybe the spirit of the first half of Av. Rav Pam used to daven daily at the Hapoel Hamizrachi shule in East Flatbush NY. How do I know? I saw him many times! I take that in the spirit in which it was meant! However, since I’m passul anyways? Might as well tell more of the story. I recently met a Rosh Kollel from Yerushalayim and told him that I was at his bris? in papers i write, i like to include relevant stories of previous leaders of groups like the current day Eidah such as Rav Sonnenfeld ztl or Rav Y. Weiss ztl that prove the kinder gentler world that once existed. among my favorites are r. sonnenfeld and the woman whose husband died on Shabbat and R. Weiss’s reaction on meeting a particular supporter of the heter mechirah. I am leaving readers the joy of self-discovery. does anyone know the identity of rav teitelbaum’s accountant?? you will be shocked, if what I heard but never verified turns out to be true. We all know that in areas of halacha, you can’t just cut and paste someone else’s psak onto your situation. We also expect that sometimes we’ll get rulings that are counterintuitive. But when a famous rabbi says something on an especially sensitive topic, it can get broadcast far and wide as the definitive word on the topic. I doubt that a gadol sitting at his dining room table -facing a long line of people clamoring for his attention- intends to completely settle large communal issues. But instead of waiting for them to go on the record by issuing a community wide statement, people walk out of their apartment saying that the Rabbi just confirmed everything they thought walking in. I think the real problem with “da’as Torah” and “gedoylim” is the immaturity of the public, who would rather use them for almost entertainment purposes than as actual guideposts. Exhibit one would be all the books with people asking R’ Chayim Kanievsky shlit”a questions that any Local Orthodox Rabbi could answer. Some of them a kid who learns Mishnayos could answer, but people take time away from R’ Chayim writing one-of-a-kind sefarim to answer parsha questions. A second problem in Israel is the combination of Judaism and politics. Say what you will about the State of Israel but it seems pretty clear that the infection of communal and religious life with all the rancor of partisan politics has been quite destructive to basic decency and achdus. Rabbi, I have been reading you for a long time. Your courage in addressing difficult issues is well known, as is your depth and your sensitivity to nuance. But I think this post – and your responses to readers’ comments – about Rabbi Eckstein A”H is the distilled quintessence of your years of thinking and grappling with the issues of our day. It is a Kiddush Hashem of massive proportions. May the RBS”O grant you long years to further sanctify His name! 1. Is the Orthodox Jewish public today any more immature than in the past? If so, why? 2. What should Orthodox leaders and followers in Israel do to assure that each Orthodox party, at least, is run transparently and for the good of the whole membership and the country? The loyalty Jews have toward their religious leaders should never cause any leaders to take them for granted and treat them unseriously. I have very little to say about the second question. I don’t believe that the leaders take their constituencies for granted. The ones creating the atmosphere that we are talking about are the underlings – the gatekeepers and askanim. And, as Lord Acton famously stated, “Power tends to corrupt, and absolute power corrupts absolutely.” They are not likely to relinquish any of their power. They have successfully trained a few generations of people to not ask the hard questions. Regarding your first question, I’m not sure that I would call it less mature. Maybe less autonomous and more dependent. A number of things contributed to this. The general hyping of “daas Torah” and “gedolim,” moving these important concepts far beyond where they used to be just a few decades ago, has left people less likely to trust their own judgment, even on relatively simple issues. It has also made them less likely to trust anyone else’s judgment, other than “gedolim.” (We see the same thing happening in the community in other areas. When people need medical advice, they rarely seek competence any more. They spend time on finding “the top” doctor, even for relatively routine procedures.) So we have people insisting on asking more questions, and asking them of a much smaller group of people. What you gain from asking is the other’s experience that he’s collected over time. No one, however, can apply that experience to your own circumstances as well as you can. What you should do is seek the eitzah of others, and then apply it yourself, using your own chochmah. R Wolbe, OTOH, writes that people often immediately run to someone else for solutions, whether in personal issues or in learning. Such a person will never become a bar-daas, he says! He will always rely on others. What a person ought to do is think it through first, develop an approach, and then talk it over with others. 1. Have any Gedolim found effective ways to manage such underlings or choose better staff? 2. In general, are the oldest Gedolim more easily victimized by underling machinations than others are? 3. Is there room for succession planning in this field as it is in business? 2) That’s what people think, and it certainly makes sense. It is hard to blame them, since you have more and more people clamoring for their time and attention. OTOH, you did have gedolim not so long ago who simply pulled out of the practice of giving answers and counsel when they reached an age where they could no longer personally gather the information they would need to address an issue. 3) That’s been going on for quite some time. It doesn’t always work. Look at the splitting of some chassidic groups into more factions than there were frogs in Mitzrayim – even when succession was spelled out. On the Litvishe side, the explicit directions that R. Hutner gave about succession began, rather than ended, a period of acrimony. I echo “Chaim7356” . Rabbi Adlerstein has been writing about certain issues that I have long thought about, for example relating to this post, a perspective on “Esav Sonei es Yaakov” and the like in “Emerging From Isolation” in Hakirah. I used to see R. Eckstein roaming around the Capitol when I clerked in DC. (Also recall seeing R. Lapin, since his name came up above, speaking at a Young Americans Conference there.) Getting Nefesh B’Nefesh started – arguably the best possible tzedakah available today – by itself would have been דיינו. A great man. I spoke to my source on Shabbos about Rabbi Wolfson protecting Rav Moshe at the Young Israel. He told me that there were actually two Young Israels in Willamsburg, this one being called “Young Israel of Brooklyn”, and its rabbi, informally called Rabbi “Mickey” Weinberger, was better known as R. Bernard Weinberger, a YTV musmach. I also asked this person to tell me of any non-YU people he remembered seeing at Rav Solovetchik’s annual Yahrzeit lectures for his father. He mentioned seeing there Rabbi Chaskel Besser, long-time Agudah activist and one of the closest confidants of R. Moshe Sherer. This reminds me of an article Rabbi Adlerstein wrote about not over-identifying with a sport or religious “team”, as R. Besser certainly belonged to and represented “Team Agudah”, yet saw good elsewhere(see “On The Internecine Battles in Israel and the World Series”, 11/13 Cross Currents). Jonathan Rosenblum once wrote that “having our bag of stereotypes battered can be one of life’s little pleasures, but one must be open to it” (see his Jerusalem Post articles “Think Again: Each One Different” 1/08, and “Dale Carnegie Next Door”, 11/06 about seeing chareidim as individuals). I started to assemble myself a collection of such items of small chidushim in hashkafah or small novelties about people.